This is a very easy and very quick dish to make. Using a julienne peeler or spirlalizer, make your zucchini into noodles. Put them in a salad spinner or on some paper towels and sprinkle with salt. In the meantime put your pine nuts in a non stick sauté pan and roast over medium heat until brown. Watch as these burn quickly. Take them out of the pan and let cool on a piece of paper towel. Rinse the zucchini noodles and dry very well. Add to the sauté pan with a tablespoon or so of pesto and cook for a few minutes. Add more pesto to your liking and let everything heat through. Take the zoodles out of the pan and on to a plate. 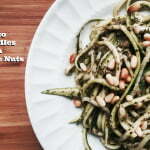 Top with pine nuts and grate cheese if using.